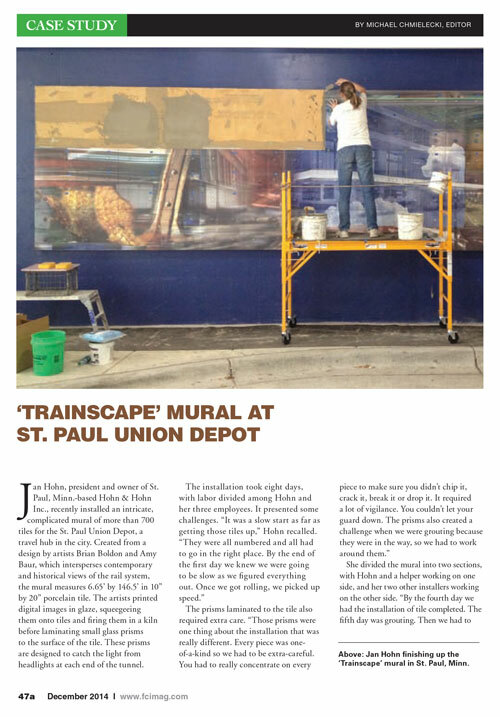 In the Fall of 2013, Hohn & Hohn, Inc. was contracted to install a public art piece in the carriageway of St. Paul’s Union Depot. Titled “Trainscape,” the piece consists of 704 ceramic tiles and its two sections span over 146 feet long and are seven feet high. 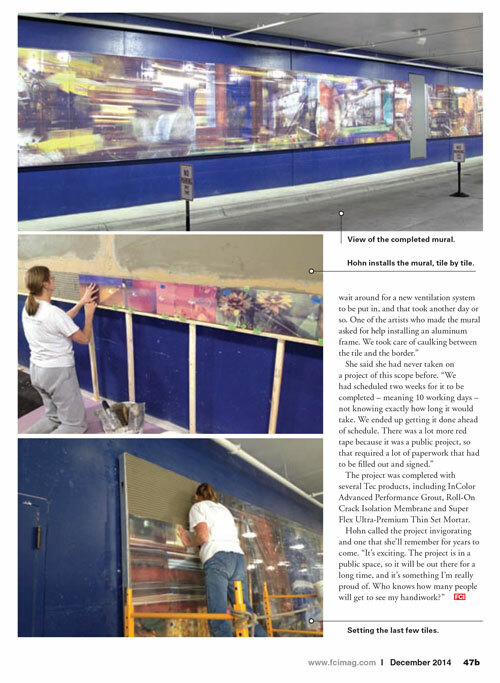 A multitude of vivid images depicting St. Paul’s Union Depot, Lowertown district and the history and present state of Locomotion were fused onto each tile, and flow seamlessly throughout the installation. Finished in early October, the project is illuminated year round and is available for public viewing twenty-four hours a day. Jan Hohn Quoted in Her Life Magazine - Working Women - Non-Traditional Careers. Five Star Contractor Spotlight – October 2012 – Hohn & Hohn, Inc. The National Tile Contractors Association (NTCA) recently honored St. Paul,Minn.-based Hohn & Hohn, Inc. with the Grand Prize Residential Award in the 8th Annual TileLetter Installation Awards Competition. The tile contractor’s work on creating a historically-appropriate breakfast room floor for a circa 1906 St. Paul home was recognized during a special ceremony that took place on March 17, 2011 in Las Vegas, Nevada at the 2011 Coverings Tile + Stone Expo. The award is a tribute to the technical excellence and craftsmanship exhibited in the project. Hohn & Hohn, Inc. was contracted for glass tile installation work at the historic Park Inn Hotel in Mason City, Iowa – the only remaining Frank Lloyd Wright-designed hotel (of the six for which he was the architect of record) in the world. During the renovation process, the general contractor discovered iridescent glass tile in the brick mortar joints of the columns in one portion of the building. The decision was made to have new glass installed in the brick mortar joints of the upper columns in what would become the hotel’s ballroom. Hohn & Hohn, Inc. completed the project in early August. 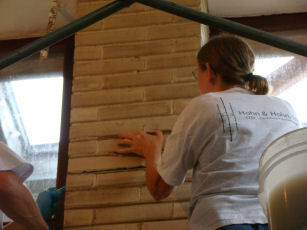 Check out photos of the hotel and the restoration process on the Park Inn’s web site. © 2015 Hohn & Hohn, Inc.